An all-new Walt Disney Animation Short Films Collection is available this week in a Blu-ray/DVD/Digital HD combo from Disney Home Ent., including Oscar winners Feast and Paperman. It’s been nearly 10 years since John Lasseter resurrected Disney and instilled a new renaissance, including the adoption of a regular shorts program, which has earned two Oscars, so it’s an apt time for a Disney collection. There are a dozen works (nine from the Lasseter era) and it’s a terrific snapshot of the studio’s tech and ethos. Patrick Osborne’s Oscar-winning Feast is a love letter to food told from the lovable dog’s point of view. It boasts quick montage-style cuts and contains a distinctive look exemplified by the use of flat shapes and colors and shallow depth of field. With Winston and his love of food, all is well in the end. The meta Mickey hybrid, Get A Horse!, from director Lauren MacMullan and assisted by Eric Goldberg, is a wonderful metaphor for Disney’s resurgence. It’s like a dialogue between the past and the present, ending in aesthetic harmony. It’s not about technique: it’s about storytelling, and Mickey heroically bursts through the screen to save the day. 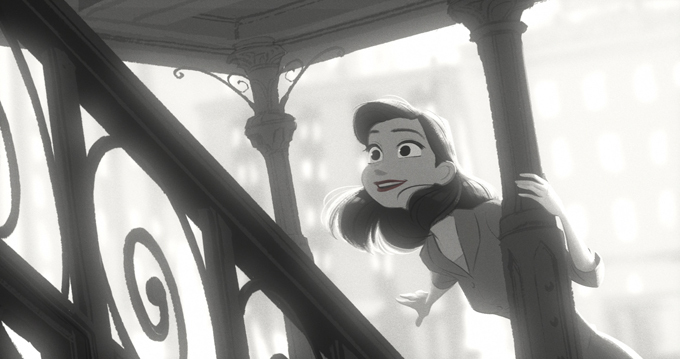 The Oscar-winning Paperman was a hybrid tech breakthrough, a back door attempt to keep hand-drawn integral to the aesthetic through the vector-based Meander interface that director John Kahrs hijacked for his short. It’s the power of the line meets the dynamics of CG in the tender love story inspired by the mid-century WPA New York photos. The Little Matchgirl from Roger Allers (The Prophet) is the last of the shorts highlighting international music and the final one to utilize the CAPS compositing and rendering program, which provided an innovative way of painting the 2D characters with a watercolor texture in this story about a lonely, starving, homeless child in a mythical Russia. Lorenzo, based on Joe Grant’s premise about a spoiled South American cat vexed by an uncontrollable tale, is brilliantly executed by director Mike Gabriel (currently production designer on Gigantic). It’s strikingly original: a moving painting that digitally captures the loose, dry, rough, texture of a brushstroke. How to Hook Up Your Home Theater kicked off the Lasseter shorts program with Kevin Deters and Stevie Wermers capturing the spirit of the How to Goofy shorts from the ’40s and ’50s. After buying a big-screen, HD TV, Goofy gets exasperated trying to set it up himself — with all of the wiring and remotes — in time for the big football game. Bonus extra: @Disney Animation, an inside look at making a short hosted by T.J. Miller (Fred in Big Hero 6). Copyright © 2011 Immersed in Movies. All rights reserved.